Men's Retreat, May 17, 2019 through May 19, 2019, Skycroft Regional Retreat Center, Middletown, Maryland. Please RSVP on Sign-up Genius for the retreat and submit for your reservations below. Save the date! ORCC Vacation Bible School, Monday, July 8, 2019 through Friday, July 12, 2019, 6:00 pm-8:30 pm. This event is FREE and open to children 3 years old and up. There will be crafts, music, puppets, games, and fun galore as we learn more about the Bible and the God who loves us. Oak Ridge is hosting a table (or more) at the CPC Fundraising Gala. It will be held at the Ten Oaks Ballroom. It is an opportunity to hear about the center, their success stories from women, and goals for the future. Dinner is free, and there are opportunities to donate financially if you feel led. If you would like to join us at the table, please email Nicole Simpson at nicolesimpson6@gmail.com by March 20. Unwind From the Grind Coffee House on Saturday, March 16th. Please join us in the Potomac Room, 7pm-9:15pm. Invite your friends and come enjoy live music and coffee at the Gathering Place. If you are interested in playing, please contact Jeanine Lyons 410-596-3960 or emailunwind@oakridgecc.org. We could use some extra help to make this community outreach a success - check out thesignup genius here. Print and share our flyer. We will be inviting college students, missionaries to join us for that weekend. Bridge Builder's Conference and Outreach to Laurel, Maryland, Friday, March 8, 2019 to Wednesday, March 13, 2019. Momentum Youth Lock-in, Sunday, February 17, 2019 7 pm until 7 am, Monday, February 18, 2019, The Gathering Place. Come join us for our annual daddy daughter dance & LUAU !!! We will be hosting a "Day of Prayer and Fasting” Saturday, February 9, 6 am- 6 pm. There are a lot of great things going on in the church right now that we could be unified as a church in prayer about. Please sign up for the hour you plan to come in to pray. We do want people coming in every hour throughout the day, so make sure every time slot gets covered. We also encourage everyone to fast for part of or all of the day. We will provide water and coffee throughout the day. After the day of prayer is over at 6 pm, we invite everyone to have a meal together at the church. If you leave earlier in the day, come back for dinner! Please write in the comments here if you will join us for the meal, provided by the church. Faithwalkers is a once-a-year opportunity to learn from God's word, worship with the body of believers, and grow as a disciple of Jesus Christ. Join us this year as we discover what it means to live a life rooted in faith, hope, and love. 6 pm, Monday, December 24th, 2018 at The Gathering Place. Please come to worship and hang around for light refreshments afterwards. Please check out the Sign-Up Genius to help with refreshments! Come join us for an evening of fun, friendship, and encouragement as we begin the Advent season. Children's ministry will provide dinner and crafts/activities to help us prepare for the celebration of Christmas. Practical, loving workshops lead by Tony Pierson and Emily Pierson. This is a great time to improve marriages, parenting, relationships of all kinds by learning to truly understand one another and yourself better, then to help. It's a busy weekend, so feel free to sign up for one, two or three sessions. They are all stand alone workshops. Saturday morning, 9am-12:30pm - Listening to Understand – Developing trust and respect through understanding. Patapsco Room. Saturday afternoon, 1:30pm – 4pm - Speaking the Truth in Love – Effectively confronting without creating defensiveness. Patapsco Room. Sunday afternoon, 12:30pm – 4pm - Renewing Your Mind – What we believe drives our feelings and behaviors, learn to uncover and change your beliefs. Upper Level couch room. Please RSVP under 'MY RSVP' and use the 'Available Slot' to note which sessions you will be attending. You and your neighbors, family and friends are invited to Oak Ridge Community Church's annual Harvest Party. We hope to have hayrides, games, square dancing, and OF COURSE, lots of food and fellowship. Please take the time to RSVP in the comments section. You can indicate how many adults and kids are coming with you. Feel free to share this event with those you know. 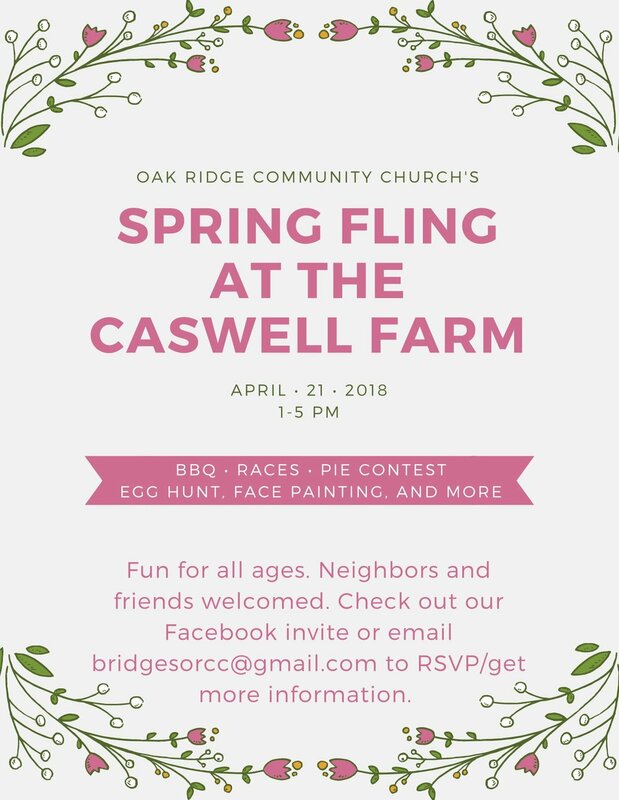 If you need the Caswell's address, email bridgesorcc@gmail.com *before the day of the event*. Hope to see you there! Event will be held upstairs in the library, lunch will be provided. Vacation Bible School "Queen Esther: For Such A Time As This"
The amazing story of brave Queen Esther! When Esther miraculously becomes queen she is suddenly caught in the middle of a wicked plot hatched by a man named Haman. Esther seeks the advice of her guardian Mordecai, who encourages her to boldly intervene and trust God. Come join us as we learn about the bravery of Queen Esther and God's deliverance of His people. We'll have meaningful lessons with high energy fun through crafts, music, puppets, skits and more! Open to children 3 years old and up. Which church are you currently attending, if any? To better meet the needs of your Pre-K child, please leave their Date of Birth in the comment field at the bottom of the form. Do you want siblings in the same group? If applicable, list any allergies, medical conditions, or special needs or any other additional comments. Join us at the annual River Hill 4th of July parade to hand out flyers & freezer pops! Meet at the VBS float no later than 8:30am at Pointer's Run Elementary. (Restrooms will be open at the school and parking is available across the street at Clarksville Middle school). The parade is about 2-1/2 miles long and will start at 9:00am, ending at River Hill Village Center. There is a post-parade reception for participants at the Clarksville Fire Dept. until 12:00pm. Don't forget to wear your ORCC T-shirt! If you need one, please contact the church office. Come support the Columbia Pregnancy Center and the women choosing life. This baby shower would bring the center new donations for mothers in need. The director will speak at this event, and food and refreshments will be provided. All are welcome to come fellowship and support this great cause. Contact Nicole Simpson with any questions. The mothers at the Pregnancy Center don't often get "celebrated" for being a mom, so lets give them a special day to feel honored for their very important role. Their children will be there, and your kids are welcome too. We need volunteers to help bring food, drinks, crafts, and a gift items to make this a special day. Sign up here. The Spenard family has hosted 16 high school exchange students over 13 years. They have become part of our family and our hearts. Now we want to add another member, this time through adoption of an older child. Oak Ridge Community Church is partnering with the Spenards in the outreach to others to share God's love in support of this fundraising event. Please join us for an evening of food and fun featuring talented local musicians and singers plus Charming Faces Face Painting to raise funds toward adoption fees. We will have chili, toppings, desserts and soft drinks for you to enjoy. Oak Ridge is hosting a table (or more) at the CPC Fundraising Gala. It will be Thursday April 19, 2018, 7 pm at Ten Oaks Ballroom. It is an opportunity to hear about the center, their success stories from women, and goals for the future. Dinner is free, and there are opportunities to donate financially if you feel led. 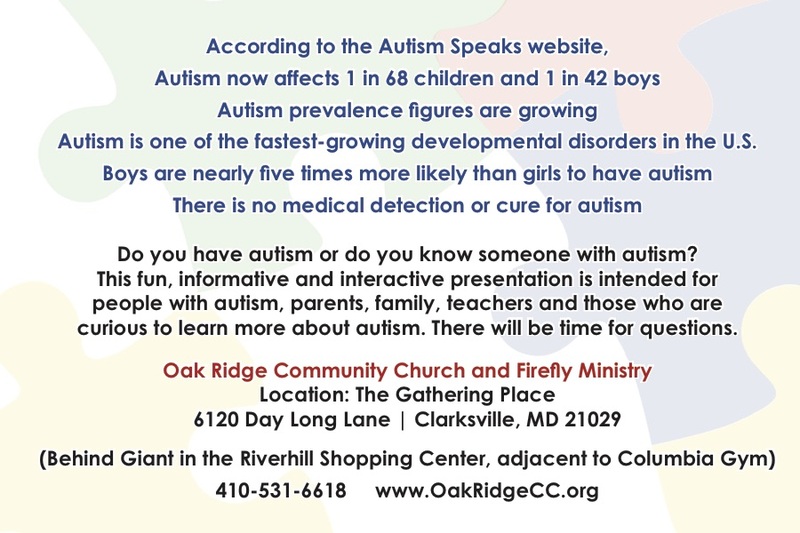 If you would like to join us at the table, please email Nicole Simpson at outreach@oakridgecc.org by March 30. Thank you! Please indicate how many seats you would be requesting. Join with us for a time of celebration as we sing together, hear testimonies and witness baptisms of those who have professed their faith in Jesus. There will be no sermon on this Sunday. Children are welcome to observe the baptisms.